This cemetery was probably established at the turn of the 14th and the 15th centuries. The oldest preserved tombstone is from 1439. The cemetery was extended several times via buying out the neighbouring land plots. Burial services were abolished in 1787, when a decree of Joseph II prohibited utilization of burial places inside the inhabited parts of the town. 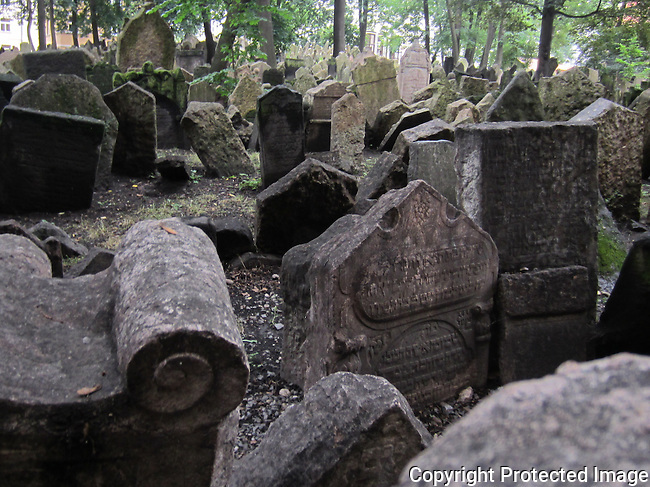 There are more than 12,000 tomb stones in the Old Jewish Cemetery, yet there are many more remains buried here. Many tombstones fell in the lower layers, and other, namely the wooden ones, were destroyed over time. Because the religious habit prohibits the Jews from abolishing old funerals, and the land plot was too small to meet the needs, more and more layers of new earth was brought to the cemetery, and older tombstones used to be elevated into higher level, until there were up to 12 layers and many places are characteristic for piles of stone tombstones from different centuries right next to each other. One of the Renaissance-Baroque sarcophagi covers the tomb of the Prague ghetto’s most significant thinker and the Talmudian school rector, rabbi Jehuda Löw. Many tombstones contain symbols stemming from the Jewish tradition, such as a bunch of grapes (symbol of fertility and wisdom), a moneybox (symbol of charity), or the hexagram star of David. The origin and the family of the deceased can be marked, for example, by blessing hands (the descendants of the temple priests), by a kettle with water or musical instruments (descendants of the helpers from the Levit tribe), or by symbols of animals for personal or family names (lion, wolf, goose, rooster, etc. ), and reliefs of tools to symbolize occupation (mortar - pharmacist, scissors - tailor, violin - musician, etc. ).